After a week's vacation, returning to a busy work week, and then being down with a nasty cold for several days . . . well very little sewing has gotten done, and very nearly zero cooking. Especially the days I was home not feeling well, hubby thankfully took charge in the kitchen, which is so not his norm. But he did a fine job providing appropriate comfort food, including grilled cheese sandwiches and tomato soup, eggs, an occasional sweet, and plenty and varied fluids. In short, today's post will be short and sweet. 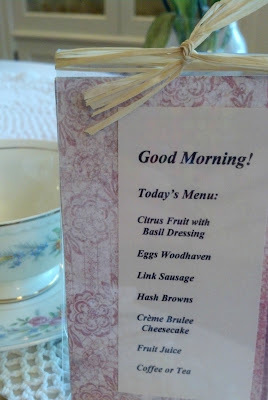 While on vacation, we stayed at B&B's for a few nights, and it was a real treat waking up to gourmet breakfasts each morning. I'm an odd one, and took photos of the menus with my phone. Luckily, I was able to find the recipe for one of my favorite breakfast entrees online! It's that French Toast Avignon up on the first menu. Find it here. (Ours was crispy on top and I'm wondering if they sprinkled them with sugar before flipping to cook that side - ?) I'll be trying that recipe out on my family one of these days, to be sure. 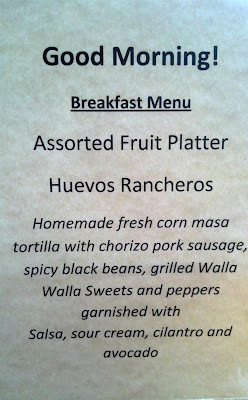 Every breakfast was super tasty, but I also really loved seeing our hostess press fresh tortillas for the Huevos Rancheros - oh my! Anyway, I also wanted to share that I finally put together a little linky give-away for this month - a short fat-quarter stack of Denyse Schmidt's Chicopee. I confess I chose my favorite colors and prints from the line, but sure hope you like them too! What do you have to share from your table?? Link up here! Your post should come with a warning - DO NOT READ IF YOU HAVEN'T EATEN BREAKFAST YET. I'm salivating here - love the sound of that macademia (sp?) 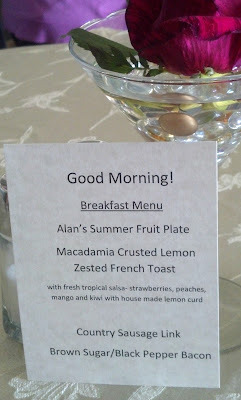 lemon crusted French toast - yum! 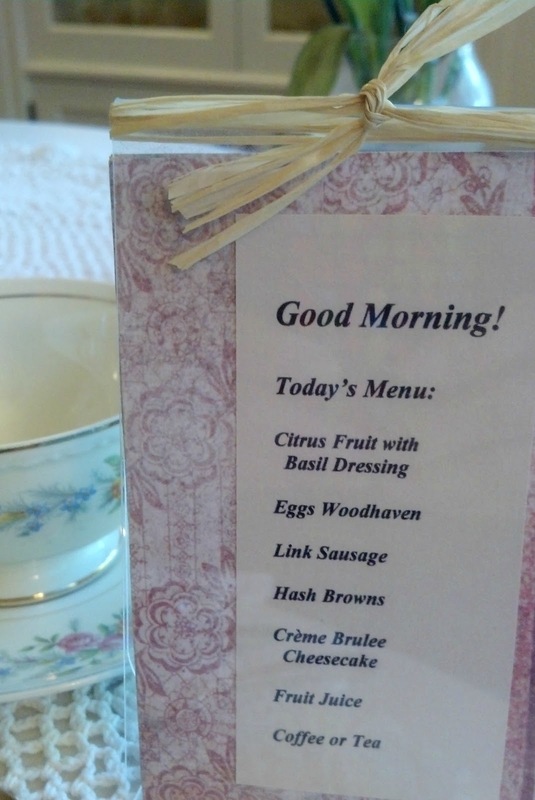 I have never seen breakfast menus before. How fun is that!!! I'm with Annabella, I haven't eaten yet and I'm drooling. 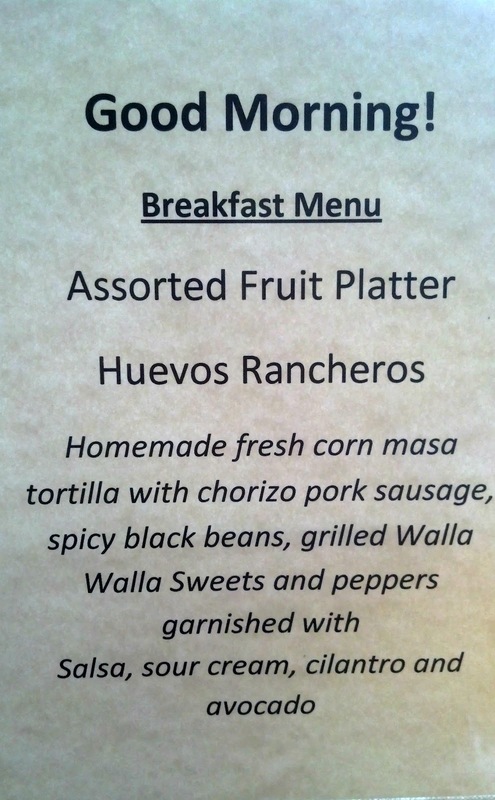 Huevos rancheros and french toast are two of my favorites. Love the Chicopee! I'm having a give away too! Come and see! 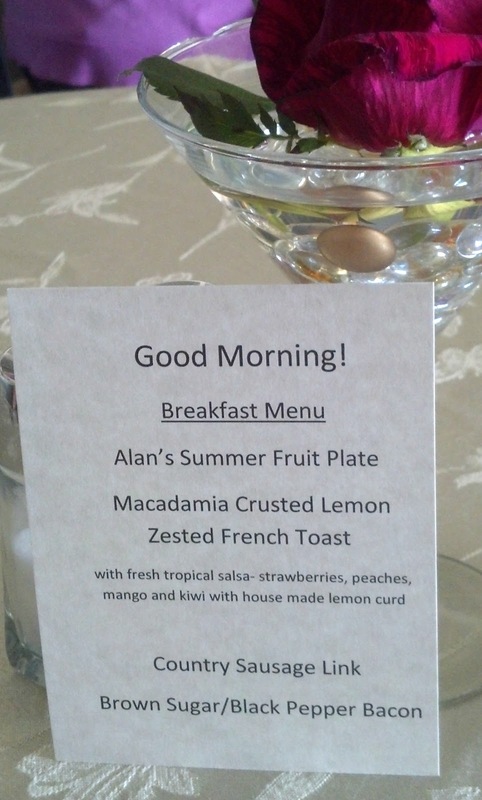 PS- breakfast has always been my favorite meal and those menus confirm that reasoning. Yum! Sorry all - I fixed the link! I linked up Tracy - here is a recipe she shared! Do all the prep work before hand, then just pop it in the oven when your ready to eat! So easy! In a small saucepan, combine the brown sugar, butter and corn syrup. Cook and stir over medium heat until sugar is dissolved; pour into a greased 9x13 baking dish. you had me at creme bruilee cheesecake for breakfast! and fresh pressed tortillas, oh heavens! ive got to make something delicious so i can link up... maybe all of the canning i have been doing... would that count? That all sounds way too delicious - I wouldn't know what to choose! We hardly ever have cooked breakfast so it is always such a special treat when we are away somewhere, even if it is just bacon and eggs by the campfire. Yum! 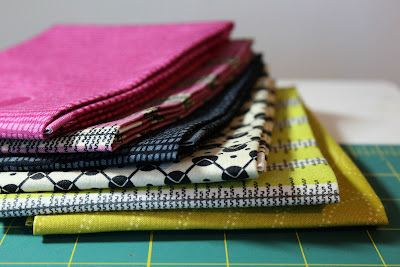 I'm working on a table runner right now so I'll be linking up next week. I just had a fresh peach, with some chopped basil, almonds, sunflower seeds and pumpkin seeds--with olive oil and wine vinegar for dressing---yum! This is the best time of year to enjoy eatting...well any time is good! Hope you are feeling better. Blessings! 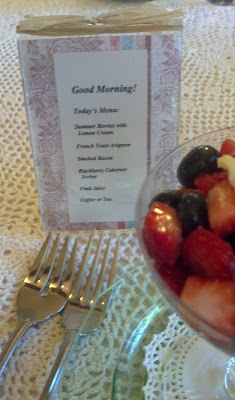 I dream about waking up and having a menu to look at with delicious foods like those...yum!